I never thought I’d run a marathon because I never wanted to. But I enjoyed training for the half marathon so much I thought, why not? 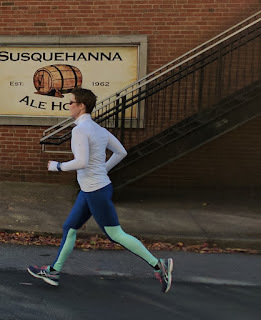 So now I’m a marathoner – Harrisburg Marathon 2016. Still smiling 26+ miles later. It was freezing before the race – literally only 30 degrees. Nearly wore gloves, but very glad I didn’t because it was in the 60s by the time I finished. Sunny, mild temperature, no gusts of river wind. Ideal. My goal time was 4:15, about 9:44 per mile pace. This was a realistic goal based on my half-marathon pace—I was advised to add a minute to my half pace—and the paces I consistently ran while training. I assumed I would go a little faster than that, occasionally getting down to 9:30s or even a few at 9:20. It always takes me about three miles to warm up, and my first three miles were within my goal range. When my fourth mile dropped to 8:47, I told myself to relax and don’t take it out too fast. So I eased up to a 9:08 pace for the next three miles until I went down to 8:49 again at the eighth mile. This was also about when the four-hour pace group was within sight. Could I really pull off a sub-four hour marathon on my first try? Not likely, but it was encouraging to see how close it was. I felt great, didn’t feel like I was pushing it too hard, but I knew I still had a long way to go. Each mile my watch vibrated and I checked my split, and each mile it was at or under nine-minute miles. Each mile I told myself to slow down and relax, and I did, and I still felt great. I thought even if I have to slow it down to 9:30s later, I’d still be way under my goal time. There was a clock at the 13.1 mile marker, and I crossed it at exactly two hours. And it was after that that my splits started dropping: 8:38, 8:26...and then stayed there at a pace faster than my half marathon pace. But I still felt great! Each mile I continued to tell myself to relax and wondered when I would start to crash. About 15 miles of the course was an out-and-back from City Island to Fort Hunter, a long, flat stretch of road. It started to get hotter. Runners shed their clothes all over the course. Gloves, ear warmers, shirts, arm sleeves were every few feet. I worried this stretch would be dull, but it wasn’t because I got to see other runners, wave, shout encouragement, give and get high-fives. Running that far without conversation provided plenty of time to be in my head, even though I concentrated on relaxing into my body. I developed a mantra: “I’m a competitor. I’m a competitor. I’m a competitor.” That was my positive self-talk for miles. And I am a competitor, not in the sense that I thought I was going to win or even get top ten in my gender age group (I didn’t), but that I know how to have the best race I can with my circumstances. I trained hard, ate well, and slept enough for months prior to the race. I fueled and hydrated appropriately before and during the run. When my hips and achilles started to hurt around mile 16, when I knew they would, I could tell myself, “I know this pain and I know I can run through it. There’s time to recover later.” I ran a smart, well-prepared race, and I knew it while I was racing. I could feel it, and it was amazing. Magical. My 20th mile was my fastest at 8:21. Well, this is it, I thought. I’d never run more than 20 miles before, and I’d heard from more experienced runners that something happens to you after mile 20, especially if you’ve never run that far before. So I anticipated a sharp increase in time when my watch buzzed at mile 21. But nope, I had only gone up two seconds for an 8:23 split. I had also passed the 3:55 pace group during that mile. This is crazy! I thought. But I still had over five miles to go. My legs were stiff from my hips to my toes, but otherwise I still felt great. My “competitor” mantra kept me mentally positive, I had plenty of energy, and I felt relaxed and at peace. I knew there’d be a bigger crowd as I neared the Walnut Street Bridge, and the crowd would keep me energized. I love when people shout my name and I love it when strangers tell me I have a great pace. They have no idea what my pace should be, but that positive encouragement and energy is the important part. As I turned onto Locust Street, a block from the finish line, I nearly cried with relief. And then I heard my mom shouting for me on the corner of Locust and 2nd and I felt more like smiling when I knew my parents were there to share in this important experience. In this picture of me that my dad snapped within the last few feet of the race, I think I am smiling. “You did it! You did it!” my mom kept shouting. I gave her a high five as I rounded the corner and then gave everything I had left into the finish. And I had done it, completed my first marathon. But not only had I completed my first marathon, I had shattered my goal time by 23 minutes to end in 3:52:39. I never, ever imagined going under four hours, and certainly not over seven minutes under! I crushed it. In fact, I negative split it, and my second 13.1 miles was three minutes faster than my fastest half marathon. I think I’ve earned the right to say that I am truly impressed, amazed, and proud of myself for training for and finishing this and for feeling so wonderful about it. I wonder what else I can accomplish that I never thought possible.